I want to start by sharing a little snippet of what Austin and Micaha said about working with me, because I don't think any review has ever so accurately described my dorky behavior. "When we first met Sarah for our engagement session we knew we had made the right decision. She was completely fan-girling over the greenhouse that we had our photos taken in. Her enthusiasm made us laugh and feel incredibly comfortable with her." I am still fan-girling over that greenhouse engagement session, this amazing couple, and their wedding day. Austin & Micaha have an enormous love for everyone they surround themselves with. Their wedding day focused on their relationship and their commitment to each other, but they also made very intentional and thoughtful decisions on how to show the impact their families and friends have had on them over the years. They have an incredible, independent, and smart nearly-two-year-old girl, Charlie. She was a great flower girl and her reactions throughout the day were priceless. Charlie is not nearly as amused by my antics as her parents are, but she had a wonderful time celebrating. 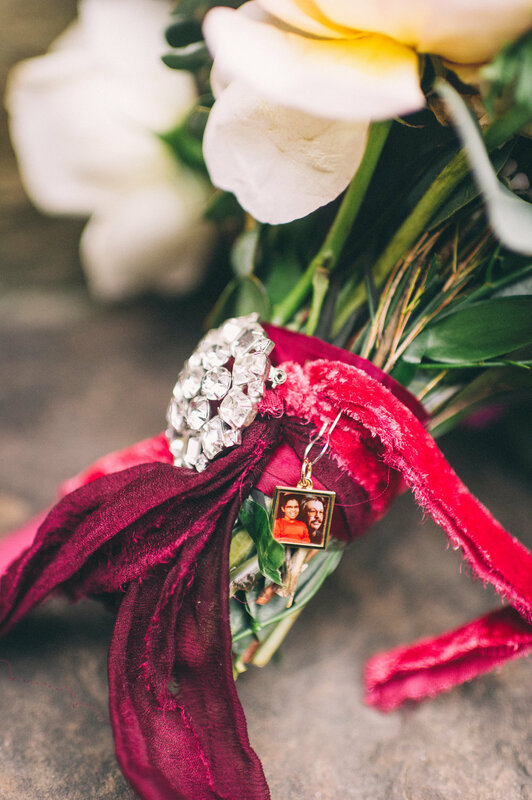 Micaha's father passed away when she was young— she had his picture in her bouquet to make sure he was part of their day. When it came time for the special dances, Micaha suprised family members that have meant a lot to her over the years by inviting each of them to the floor to share a dance with her. Her dances with her mother and brother were laid-back, filled with chatting and smiles. Then she invited her father-in-law to the dance floor. He clearly wasn't expecting it— and immediately covered his mouth and cried. I saw this same sweet expression from Austin countless times— at that moment I knew exactly where he got it. Their dance was sweet, upbeat, and silly and I loved seeing each relationship reflected in these moments. They finished the special dances by swaying together with Charlie. Other items of note: they followed the southern tradition of burying bourbon before the wedding for good weather— it was hovering around 40 degrees all day, but never rained despite the forecast saying it would, so I 100% call this a win. Micaha's side of the wedding got ready at their adorable historic home in Lexington and I dorked-out over the giant fiddle leaf fig, their book collection, and the coral pieces they had around the house! Also, they had two food trucks serving dinner and everything was AMAZING. Okay, that's enough from me— I hope you enjoy their pictures as much as I do! If you are looking for more Kentucky farm vibes check out Angela & Jon's Blackacre wedding or Liv & Daniel's bohemian Gingerwood wedding. Austin & Micaha’s wedding has been featured on Simply Southern Weddings, The Knot, Tops Lexington, and Boho Weddings.